Samsung Electronics has shipped 5 million units of its “smart notepad”, the Galaxy Note, surpassing most expectations, according to analysts. “Compared to what people thought when it was released, Samsung has delivered above expectations,” said Neil Mawston, executive director at market research company Strategy Analytics. CCS Insight’s Geoff Blaber agreed. “For a product which many initially thought sat in a no-man’s land between smartphones and tablets it has done phenomenally well,” he said. 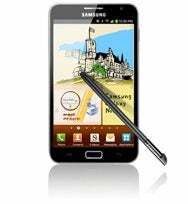 The Galaxy Note was originally launched in September. It has a 5.3-inch Super AMOLED display with a 1280-by-800 pixel resolution, and can be used as a smartphone or a “smart notepad,” according to Samsung. The digital S Pen lets users write and draw directly on the screen. “It is quite an attractive looking product. It is sleek and shiny, and that seems to resonate with consumers,” said Mawston. “The 5-inch screen is really cool if you don’t mind holding it to your ear when making a call, or using a headset,” said Cozza. Samsung’s marketing of the Note is something that analysts also highlight as one of the reasons why it has managed to ship 5 million units. Samsung’s latest publicity stunt shows an elephant using the Note, a juxtaposition that is more flattering to the device when it is held up to so large an ear. “Samsung has been promoting the Note hard, and the company has pretty deep pockets these days,” said Mawston. The company has become more canny with its marketing as a whole, not just the Note, according to Blaber, who thinks that the Note has been helped by the success of Samsung’s Galaxy S II. “The Dell Streak had 5-inch screen when 3-inch screens dominated, that leap was too far for consumers. But now consumers in developed markets are much more familiar with 4-inch to 4.5-inch screens, so the jump to 5-inches is no longer such a chasm,” said Mawston. Also, the Streak wasn’t helped by Dell’s lack of brand awareness in the mobile space and a bad user experience, according to Mawston. Android simply wasn’t ready to be used on a device with a bigger screen, Saadi said. But just because Samsung has blazed the trail doesn’t mean similar products, including LG Electronics’ Optimus Vu, will become a success. “I think that competitors will struggle to reach the kind of volumes Samsung has witnessed,” said Blaber. Even if Samsung has managed to turn the Galaxy Note into a success, the company can’t rest on its laurels. The Note was supposed to get Android 4.0, also known as Ice Cream Sandwich, during the first three months of 2012, but the upgrade has slipped to the second quarter. Also, the digital pen needs to be improved, according to Cozza. There are some glitches, and it isn’t as responsive as it could be, she said.